Joe consistently demonstrates excellence in every interaction, whether with patients, colleagues, or facility staff. Humble to a fault, Joe is an ideal Star of Life. He is the epitome of a team player and is always pitching in to lend a helping hand to his fellow employees. 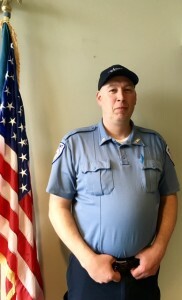 Joe consistently picks up shifts when staffing is needed, cleans extra trucks, and assists fellow EMTs. Joe has gained a reputation for being a dependable, hardworking and responsible coworker and is well respected by both his peers and the managerial staff. Additionally, Joe is known for his loyalty to his Armstrong colleagues, even going so far as to organize a fundraiser for a fellow EMT. Joe is always looking for ways to make company improvements. He comes up with creative and practical solutions to issues and communicates them so that best practices can be implemented. Joe has stated that the most rewarding part of his job is helping the public and easing anxiety for patients and their family members. He said he “does it all for just a smile.” Joe does the right thing, because it is the right thing to do. He needs neither accolades nor recognition. Joe has also been commended numerous times by both patients and partner facilities. Each day he demonstrates his capability to connect with and calm every patient. Joe is always even-tempered and excels in even the most urgent situations. His ability to relate to and work with various types of people has not only benefitted the many patients he has transported, but also the new EMTs that have come on board as well. Anytime a new EMT is trained by Joe, he or she leaves with a new mentor and friend. Armstrong Ambulance is proud to honor Joe Johnson for his work in 2015 and his eight years as an EMT with our service.